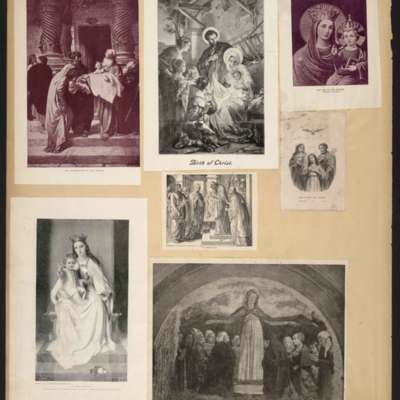 Large scrapbook containing numerous images of the Virgin Mary. 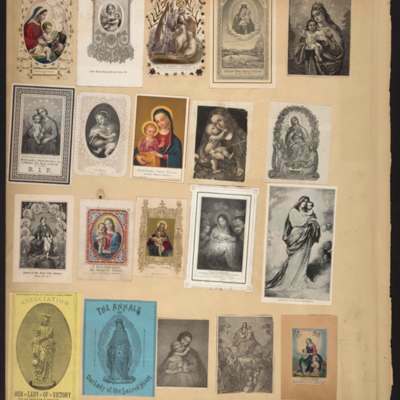 Includes prints, holy cards, images from magazines and other images. Book made by J. B. Lippincott Co., Philadelphia. 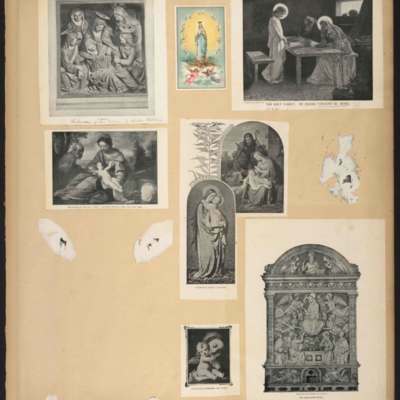 Scrapbook is marked as having belonged to Francis X. Reuss. 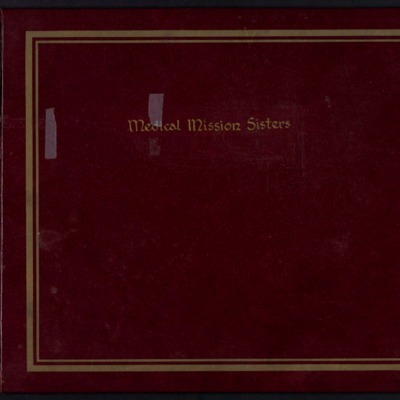 Photograph album containing photographs of Medical Mission Sisters and their institutions and patients in Asia, Africa, Europe, and the United States. Undated. Tilden's "Wolf at the Door, Gaunt and Hungry." Don't let him in. Something that will not "blow over." July 11 and July 12, 1871. 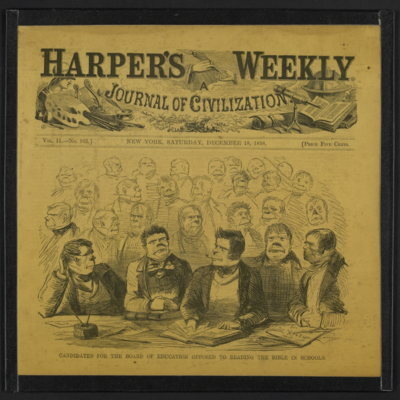 Print from Harper's Weekly, August 4, 1866. 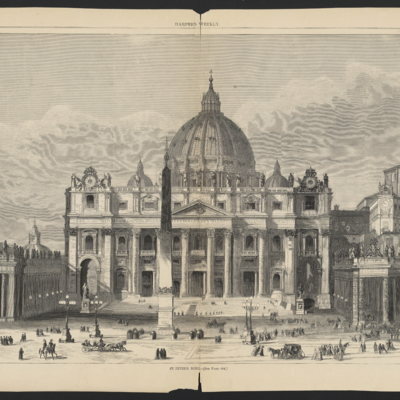 Two page spread showing the exterior of St. Peter's Cathedral in Rome. February 22, 1876. Chorus of Rising Patriots (?). "We can not tell a lie! We did not do it!" "Madness (Yet there's method in it)." Shall Teachers' Salaries Be Lowered? 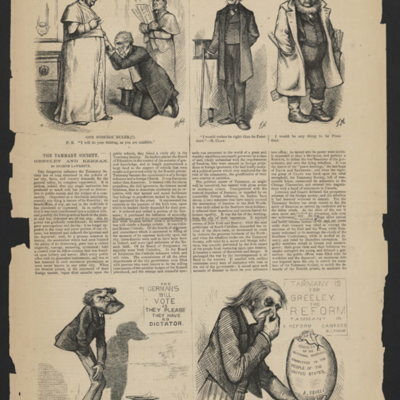 Clipping from Harper's Weekley with four cartoons and an article titled "The Tammany Society. Greeley and Kernan" by Eugene Lawrence. "Tied to His Mother's Apron-Strings." Print from Harper's Weekly, July 13, 1872. 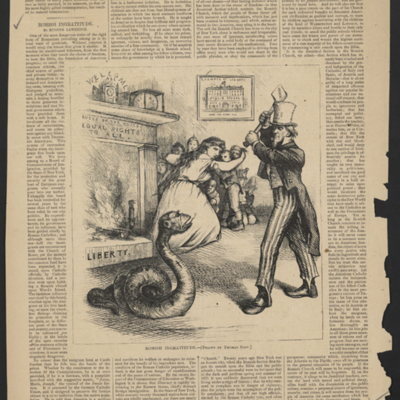 Print shows Uncle Sam, holding an axe labeled "Order", attacking a large snake with the head of a caricature of an Irish American, while Lady Liberty shields children. 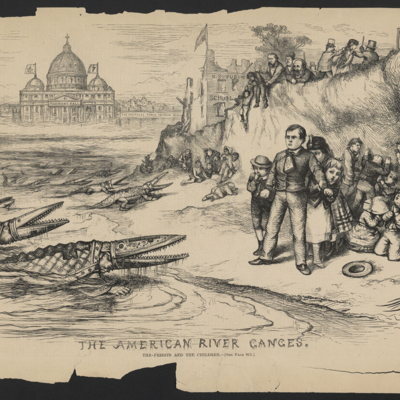 The American River Ganges. The priests and the children. Print from Harper's Weekly, September 30, 1871. 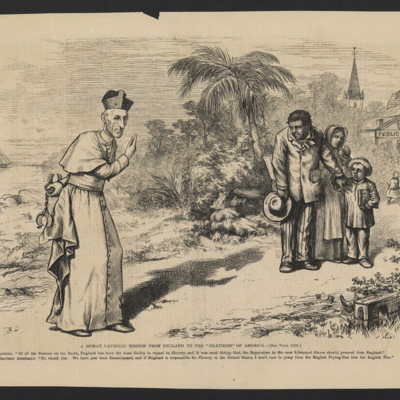 Print shows children on a beach being attacked by Catholic Bishops with mitres depicted as crocodile jaws. Print from Harper's Weekly, July 29, 1871. 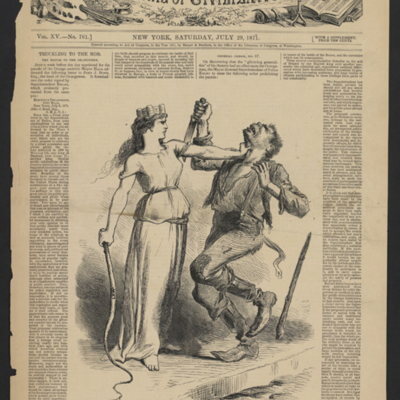 Print shows Lady Liberty, holding a whip labeled "LAW", choking a stock caricature of an Irish American holding a dagger. The Luther of the nineteenth century. "The Promised Land," as seen from the Dome of St. Peter's, Rome. 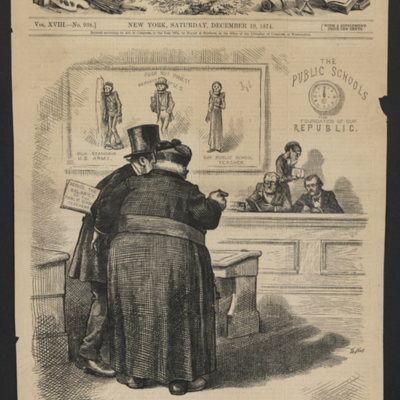 Print from Harper's Weekly, October 1, 1870. 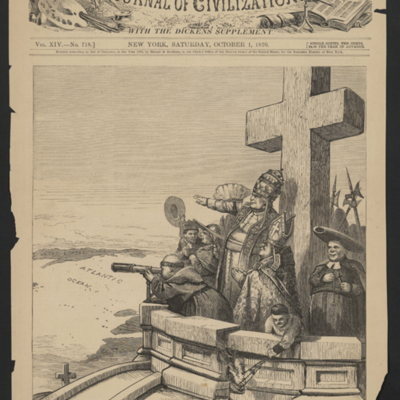 Print shows the Pope and other clergy looking at the United States, ostensibly with plans to conquer it. Special! Special! One night only! Thursday eve'g, June 16, '98. 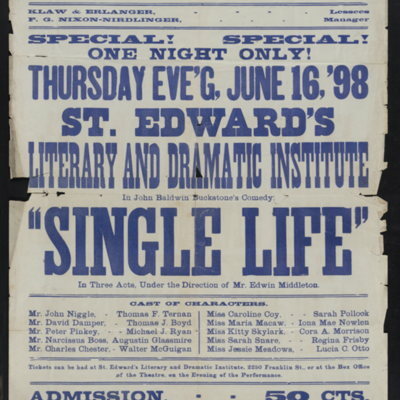 St. Edward's Literary and Dramatic Institute in John Baldwin Buckstone's comedy, "Single Life" in three acts, under the direction of Mr. Edwin Middleton. Sheridan obsequies at Washington D.C. Saturday, Aug. 11, '88. Broadside with the B. & O. 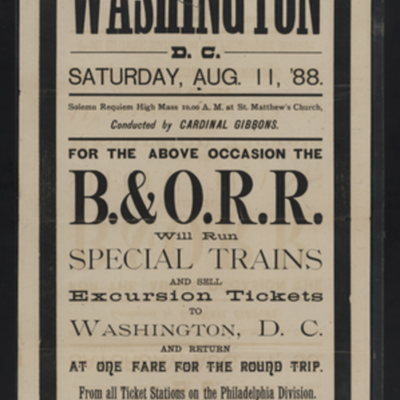 Railroad schedule for special trains from Philadelphia for the funeral ceremonies for General Philip Sheridan in Washington D.C., August 11, 1888. At bottom of broadside: "Guggneheimer, Weil & Co., Printers, Baltimore." 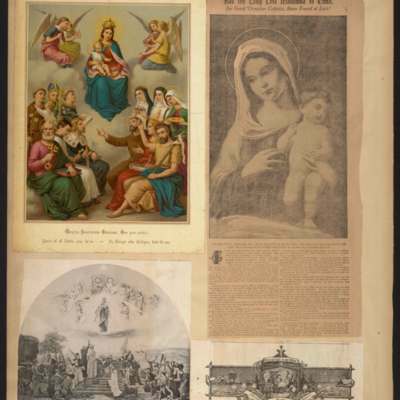 Broadside for a concert benefiting the Union Volunteer Refreshment Saloon and Hospital in Philadelphia, November 29, 1861. Badly damaged with pieces missing at top and bottom of broadside. 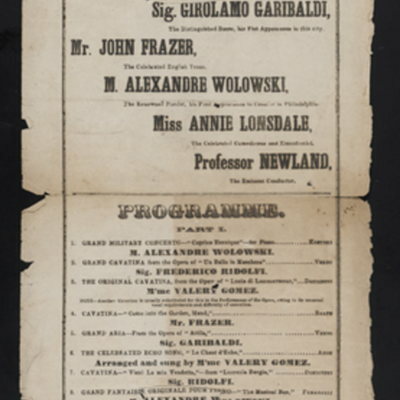 Grand Concert : Thursday evening, March 28, 1878, by Joseph Adams. 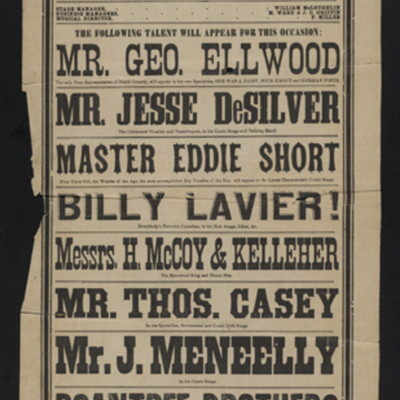 Broadside for a concert at American Mechanics' Hall on March 28, 1878. 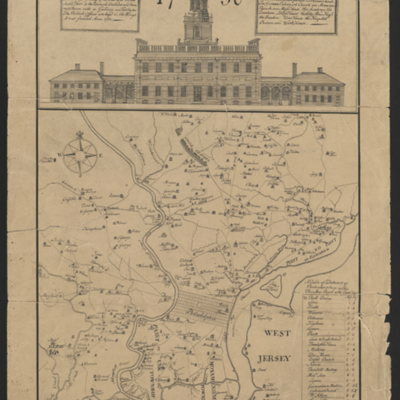 A map of Philad[elphia and p]arts adjacent, with a perspective view of the State-House. St. Francis Xavier's Cathedral, at Vincennes, in 1838. And the Clergy of Indianapolis. 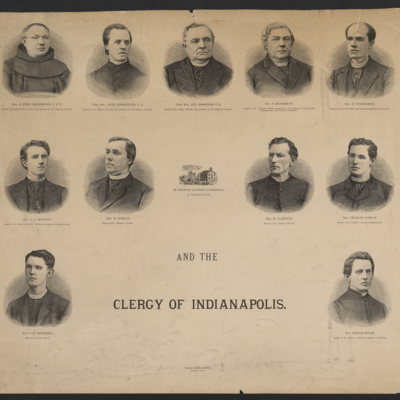 Print showing 11 members of the clergy of the Catholic Diocese of Indianapolis. 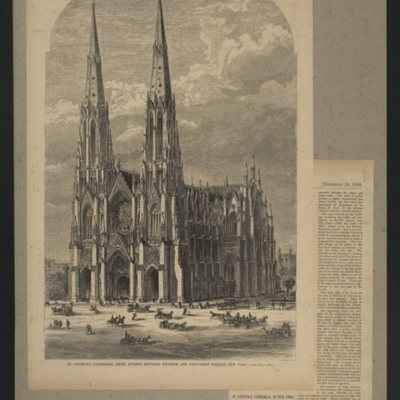 Includes a small image of St. Francis Xavier Cathedral, Vincennes, in 1838. Possibly the bottom half of a larger print. Printed by Carlon & Hollenbeck. Chicago in 1883. Junction of north and south branches of the Chicago River. 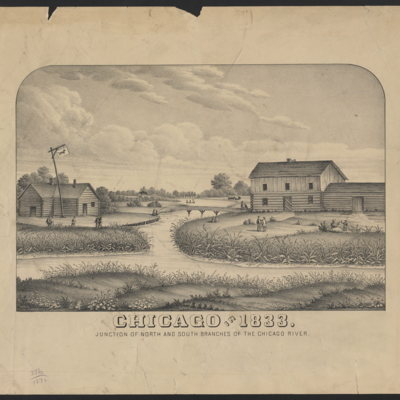 Lithograph of Chicago as it looked in 1833. Shows buildings in Chicago at the junction of the North and South branches of the Chicago River. 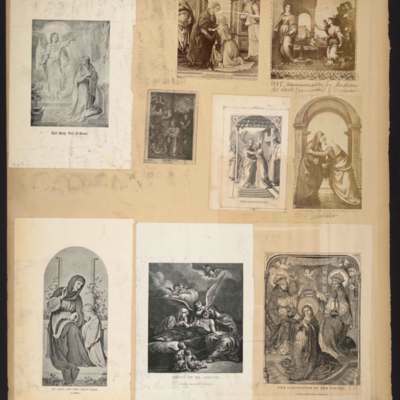 Lithographer and date unknown. St. Mary's Church. 1797. 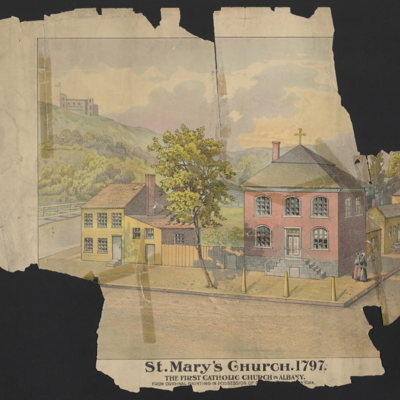 The first Catholic church in Albany. 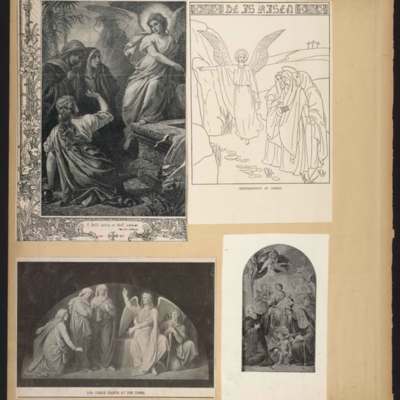 From original painting in possession of [Col. Thos. Barry, Ne]w York. 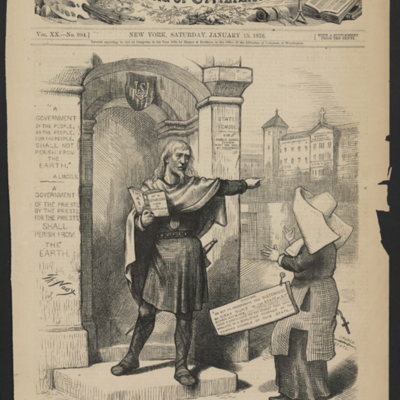 Print from Harper's Weekly, October 24, 1885. 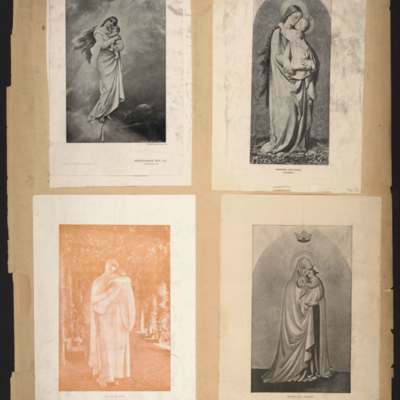 Print shows Cardinal McCloskey of New York, lying in state in St. Patrick's Cathedral. 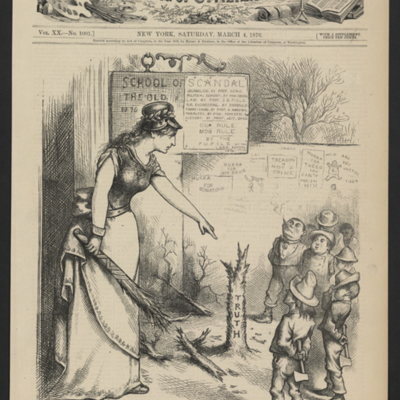 Print from Harper's Weekly, October 24, 1885. 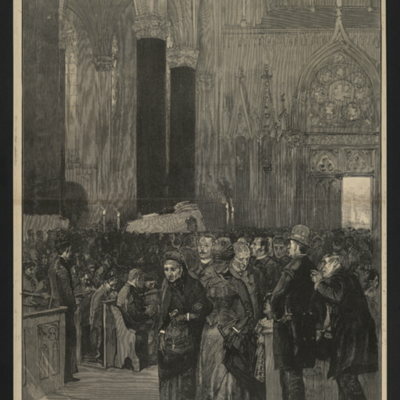 Print shows the exterior of St. Patrick's Cathedral, New York City, N.Y. surrounded by crowds attending funeral services for John Cardinal McCloskey. Typed caption adhered to print. 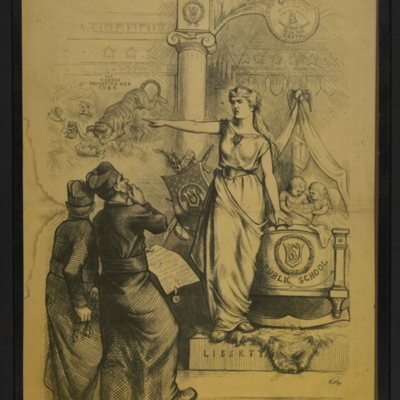 Print from Harper's Weekly showing an allegorical figure of Lady Liberty protecting the public schools from two Roman Catholic Priests. 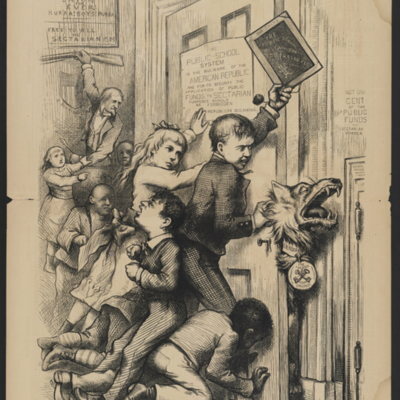 Signed by Thomas Nast. Print (engraving) from Harper's Weekly, December 18, 1869. 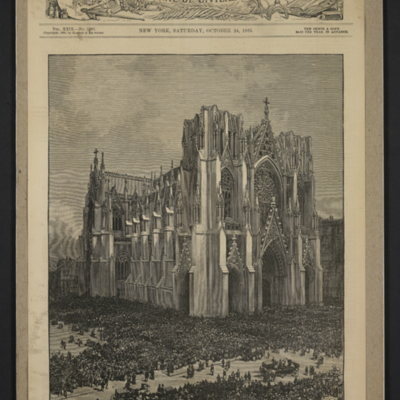 Print shows the exterior of St. Patrick's Cathedral, New York City, N.Y., and clipping of short article about construction of cathedral. Adhered to heavy paper. 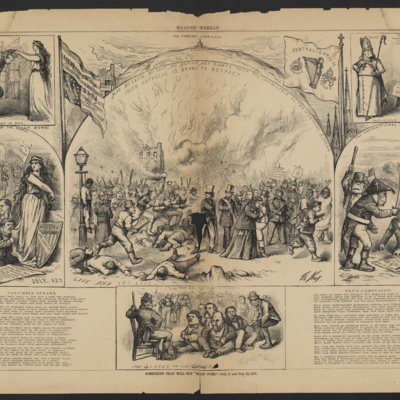 Print from Harper's Weekly, December 18, 1858. 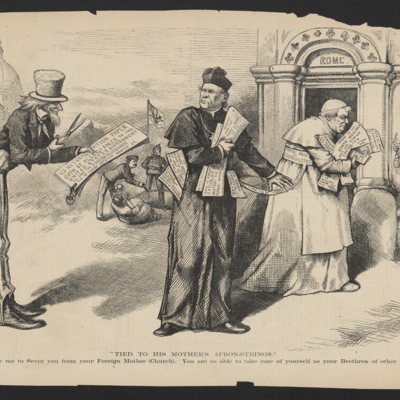 Print shows caricatures of Irish-Americans. Guests at Golden Jubilee Banquet in honor of Rt. Rev. 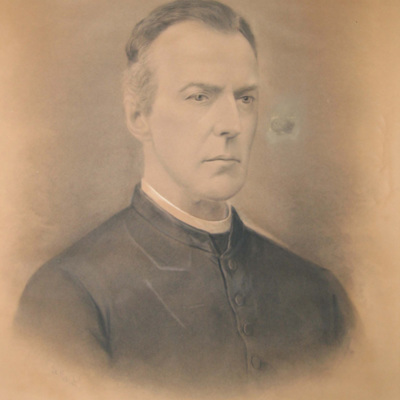 Monsignor George Bornemann. June 20th, 1915. Photograph of the guests at the Golden Jubilee Banquet in honor of Rt. Rev. 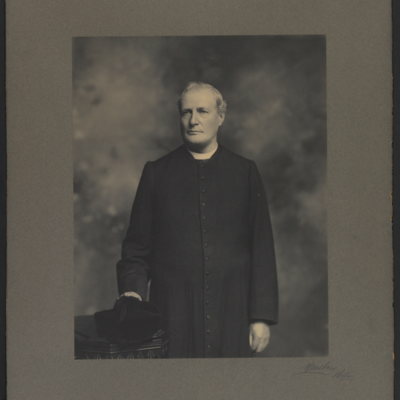 Monsignor George Bornemann on June 20, 1915. 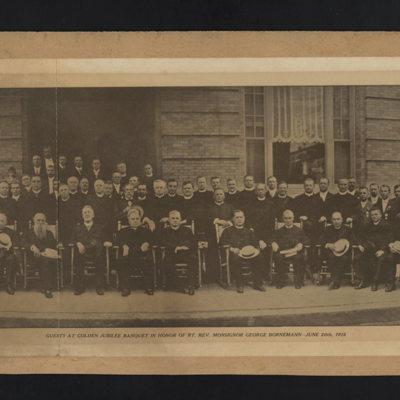 Includes Archbishop Prendergast sitting in the middle. 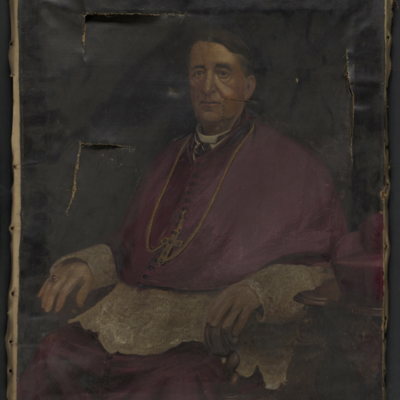 Painted photograph glued to canvas of an unidentified priest, possibly a Monsignor or Bishop. Undated. 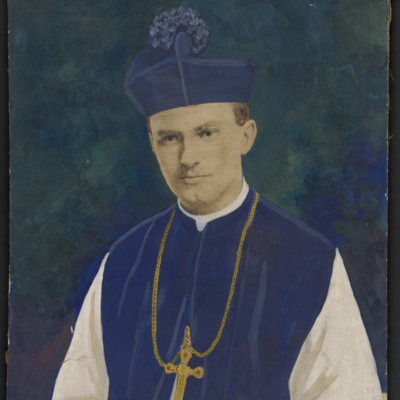 Painting of an unidentified priest. Undated. 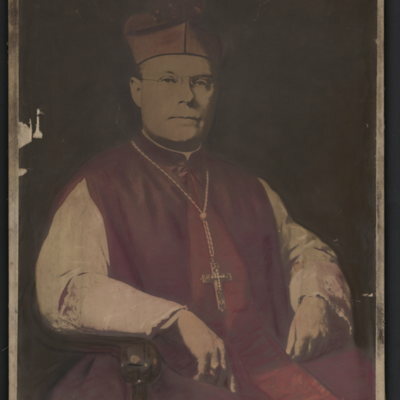 Painting over a photograph of an unidentified priest, possibly a Monsignor. 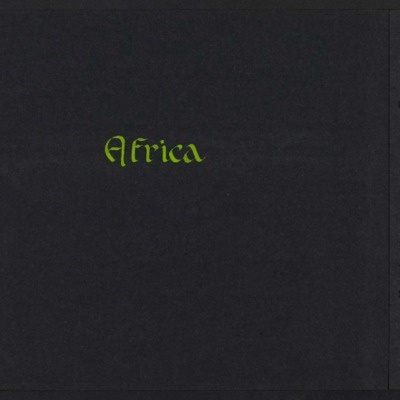 Inscribed on verso: "Made by J. F. Drichotter [? ], Holmesburg. 1930. Framed 3/7/40, Francis X. Shinke [? ], 629 Seigel St., Phila Pa."
Oil painting of Bishop Edmond Prendergast of Philadelphia. Undated. 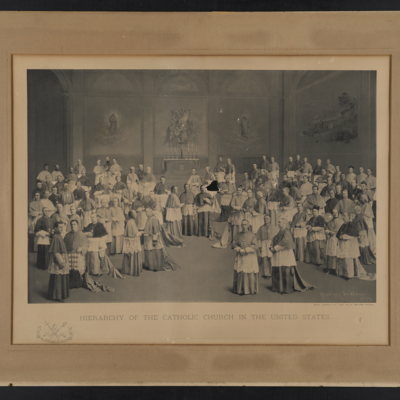 Heirarchy of the Catholic Church in the United States. 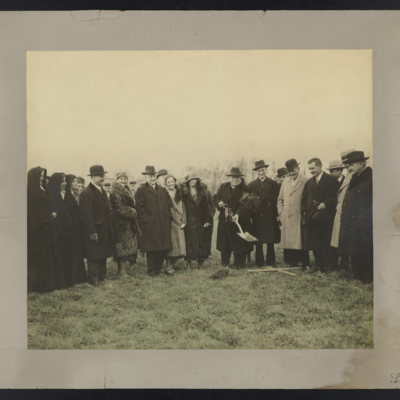 Breaking of ground, Fitzgerald-Mercy Hospital. March 2, 1932. Motherhouse of the Sisters of St. Joseph. 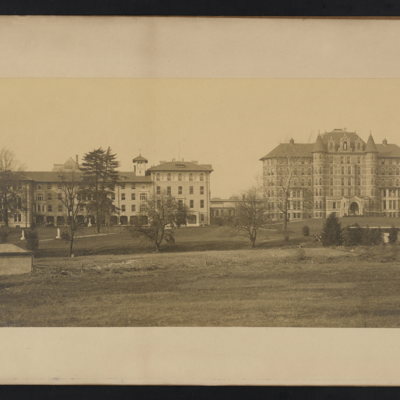 Photograph showing an exterior view of the Motherhouse of the Sisters of St. Joseph (now part of Chestnut Hill College). Undated. 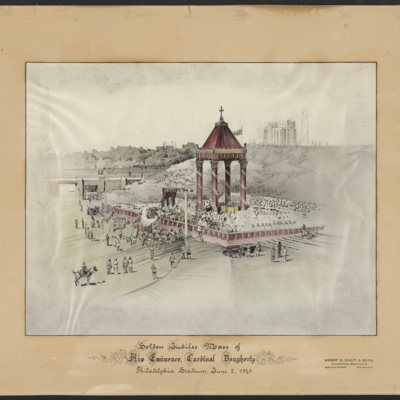 Print of color drawing showing the baldachin for the Golden Jubilee Mass of Cardinal Dougherty at Philadelphia Stadium. Backed on cardboard. 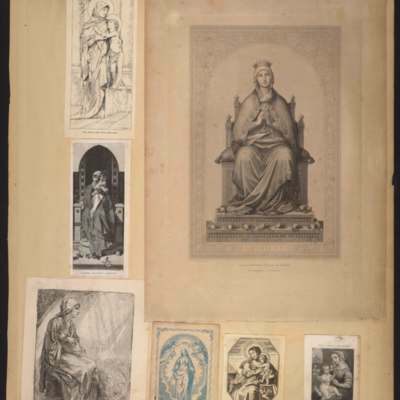 Creator's stamp appears to bottom right of print. Portrait print (perhaps pastel?) 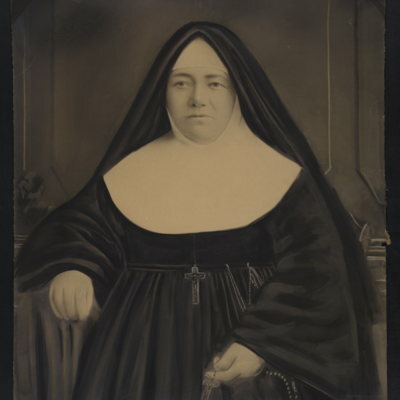 of unidentified nun on canvas. Creator unknown. Undated. 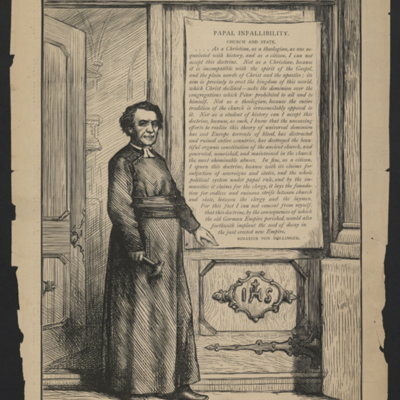 Portrait print of Bishop Ignatius Horstmann. Creator unknown. Undated. 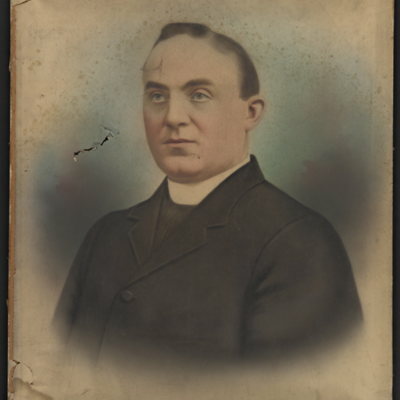 Portrait print of Reverend Joseph Ignatius Balfe. Creator unknown. Undated. 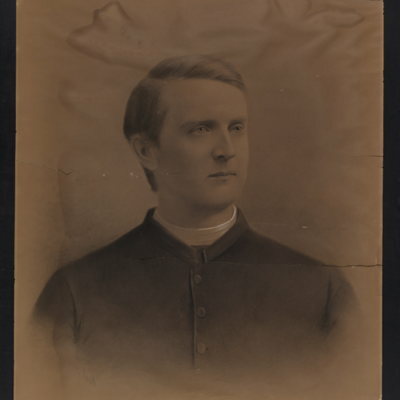 Portrait photograph of unidentified priest. Signed by Hansbury in bottom right corner.